The box is absolutely beautiful! Bruce is lovely to work with. 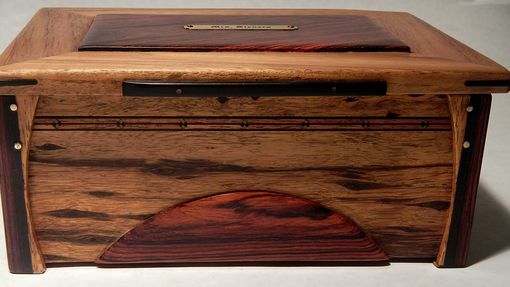 He was able to listen to what I wanted then was able to use his expertise to create a very striking memorial box for my dog's ashes. From exotic wood selection to size dimensions, Bruce guided us through the best looking options and was honest and direct when we were leaning towards things that wouldn't look good. I appreciate how easy it was to trust Bruce's aesthetic style and talent rather than having to research and worry about every detail myself. I've had bad past experiences with people who depended on me, the novice customer, to make every decision and it was quite stressful. Bruce is a professional and he was able to interpret my vision into a work of art to remember a very special member of our family. Thank you! It seems that lately I've been building almost nothing but wedding boxes, could it be something in the water? Seriously, a box of this nature makes it extra special, not only to my client, but to me also. Commenting this major life change is one of the most special times in two peoples lives. And Im very proud they have picked me to usher that moment in. As I always try to do, I evolve the client as much as they want, as I feel that a jewelry box is a dual creation and involving the client is just as important as me designing and building the box. This box was completed a few months ago, but as it was to be a surprise to Andrea, I held back at showing it. Rolf originally choose to have it made in cherry, until he spoke with me. 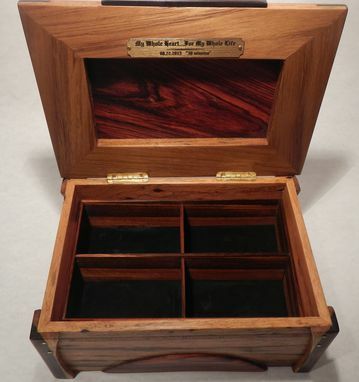 The major part of the box is now Australian Black wood, with Mexican Rosewood inserted in the center of the lid and used in the legs too. 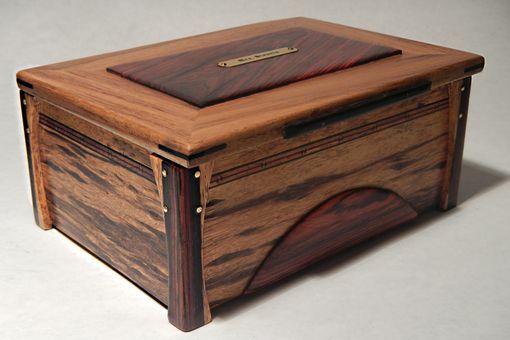 I feel that this "holds" the box together visually and is a good match, just like Andrea and Rolf. The lid pull is Gibon Ebony, as black works well in that area. Brass pins and two brass plaques add more warmth to the box, not to mention the lovely words Rolf picked out for the plaques. The removable tray is lined with Black suede. Its projects such as this one that almost wants for me to work for free, as I really had a great time making it. Every maker has a story. Be a part of "INSIDE THE BOX"'s story by placing an order, leaving a review, and seeing your review appear here.